OBJECTIVE To explore women’s perspectives on the acceptability and content of reminder letters for screening mammography from their family physicians, as well as such letters’ effect on screening intentions. DESIGN Cross-sectional mailed survey followed by focus groups with a subgroup of respondents. PARTICIPANTS One family physician was randomly selected from each of 23 family health networks and primary care networks participating in a demonstration project to increase the delivery of preventive services. From the practice roster of each physician, up to 35 randomly selected women aged 50 to 69 years who were due or overdue for screening mammograms and who had received reminder letters from their family physicians within the past 6 months were surveyed. MAIN OUTCOME MEASURES Recall of having received reminder letters and of their content, influence of the letters on decisions to have mammograms, and interest in receiving future reminder letters. Focus group interviews with survey respondents explored the survey findings in greater depth using a standardized interview guide. RESULTS The response rate to the survey was 55.7% (384 of 689), and 45.1% (173 of 384) of responding women reported having mammograms in the past 6 months. Among women who recalled receiving letters and either making appointments for or having mammograms, 74.8% (122 of 163) indicated that the letters substantially influenced their decisions. Most respondents (77.1% [296 of 384]) indicated that they would like to continue to receive reminders, and 28.9% (111 of 384) indicated that they would like to receive additional information about mammograms. Participants in 2 focus groups (n = 3 and n = 5) indicated that they thought letters reflected a positive attitude of physicians toward mammography screening. They also commented that newly eligible women had different information needs than women who had had mammograms done in the past. CONCLUSION Reminder letters were considered by participants to be useful and appeared to influence women’s decisions to undergo mammography screening. Despite the evidence that personalized reminder letters improve uptake of mammography screening rates, we know little about women’s views on the content and acceptability of such letters from their family physicians. Studies have found that women who perceive their physicians to be supportive of screening mammography are much more likely to have mammography done.10,11 In these studies, however, preventive counseling was conducted in person; it remains unclear how women perceive written reminder letters from their own family physicians. Eliciting patient feedback on reminder systems for preventive services can help ensure that features patients consider important are included, potentially improving compliance with the recommendations.12 As part of the evaluation of a larger demonstration project of a reminder and recall system for preventive care services (Provider and Patient Reminders in Ontario: Multi-strategy Prevention Tools: P-PROMPT), we examined women’s views on the acceptability, usefulness, and influence of reminder letters for mammography using a mixed methods study. A multistage cluster sampling procedure was employed to select a representative sample of eligible women. Using a random number generator, we selected 1 family physician from each of 23 family health networks and primary care networks in southwestern Ontario participating in the demonstration project (N = 249 physicians). Physicians were eligible if they had sent 30 or more mammography reminder letters in the past 6 months and had not been selected to participate in other surveys conducted concurrently by the project. All 23 of the selected physicians agreed to participate. From the roster of each physician, we randomly selected up to 35 women between 50 and 69 years of age who were due or overdue for mammography screening and had received reminder letters from their physicians within the past 6 months. Postal surveys typically obtain response rates of approximately 60%.13 The target sample size was 400 completed questionnaires, which allowed for a 5% margin of error at a 95% confidence level; therefore, approximately 700 questionnaires needed to be mailed (30 patients from each of 23 physicians). The sampling frame only included women who were mailed reminder letters. We increased the cutoff figure used in the inclusion criteria and the sample size calculation to 35 randomly selected women per physician because physicians were sent a list of the identified patients and were asked to remove any patients that should not be contacted. In some practices there were fewer than 35 eligible women according to our inclusion criteria, and after removal of the women who were no longer with the practices or who had moved or died, our final sample consisted of 689 eligible women. The survey packs (N = 689), including cover letters printed on the physicians’ practice letterheads and signed by the physicians, were mailed with prestamped return envelopes in December 2005 to the same addresses that had been used for the reminder letters. We used a modified Dillman method,14 with 1 follow-up survey package sent to each nonrespondent 6 weeks after the original mailing. The self-administered survey consisted of 18 questions that sought information about patients’ sociodemographic characteristics, recall of reminder letters and their contents, and current screening status. Additionally, women who had made appointments or who had had mammograms after receiving the reminder letters were asked to indicate on a 5-point Likert scale, ranging from “not at all” (1) to “quite a lot” (5), how much the reminder letters influenced their decisions to have mammograms. Furthermore, questions concerning interest in continued reminder letters or additional information about breast cancer screening were included. In the survey packages mailed to 6 family practices in the Hamilton, Ont, area (n = 172 women), we also included a reply sheet for respondents to indicate their willingness to be contacted about participation in local focus groups. Data were analyzed with SPSS version 14.0, using a significance level of 0.05 (2-tailed) in all statistical tests. Univariate descriptive statistics, frequency distributions, and multivariate logistic regressions were used to describe the data and to examine potential correlates of letters’ influence on decisions to schedule or have mammograms. We conducted 2 focus groups with a volunteer sample (n = 3 and n = 5) of survey respondents to explore some of the survey findings in greater depth. The interview guide solicited perspectives on knowledge of mammography, barriers and motivators to screening, impressions and responses to reminder letters, information needs, and preferred formats for information. The interviews were audiotaped with the written consent of participants. Focus group audiotapes were transcribed verbatim and were read by 2 investigators to identify themes. Data were analyzed using template style, which involved the creation of a coding manual based on the interview questions and survey findings. The study was approved by the Hamilton Health Sciences/McMaster University Faculty of Health Sciences Research Ethics Board. The overall usable response rate was 55.7% (384 of 689), with an additional 4.9% (34 of 689) of women returning incomplete surveys. Characteristics of the respondents are shown in Table 1. The mean age of participants was 57.7 years (SD 6 years). Nonrespondents (n = 305) were slightly younger (mean age of 56.8 years) and significantly less likely to have ever had mammograms (64.3% vs 86.7%, P < .001), according to the external administrative databases (OBSP and the Ontario Health Insurance Plan databases) that were used to identify women eligible to receive reminder letters. Characteristics of survey participants: N = 384. Most respondents (73.7%, 283 of 384) recalled receiving reminder letters and recalled the content of such letters. Nearly half of respondents (45.1%, 173 of 384) reported having had mammograms in the preceding 6 months, regardless of whether they recalled receiving reminder letters or not. Among women who recalled receiving letters, 71.7% (203 of 283) of respondents planned to have mammograms, 50.9% (144 of 283) reported scheduling appointments, and 47.0% (133 of 283) had actually had mammograms. According to the external administrative data, 84.0% (121 of 144) of women who reported making appointments actually had mammograms within 4 months of the survey mailing. Three-quarters (74.8%, 122 of 163) of the respondents who recalled receiving letters and who either made appointments or had mammograms indicated that the reminder letter influenced their decision “a lot” or “quite a lot” (scores of 4 and 5 on the 5-point Likert scale; Figure 1). None of the variables examined in multivariate logistic regression (age, marital status, education, employment, self-reported health, place of birth) was significantly associated with the letters’ influence on decisions to schedule or have mammograms. 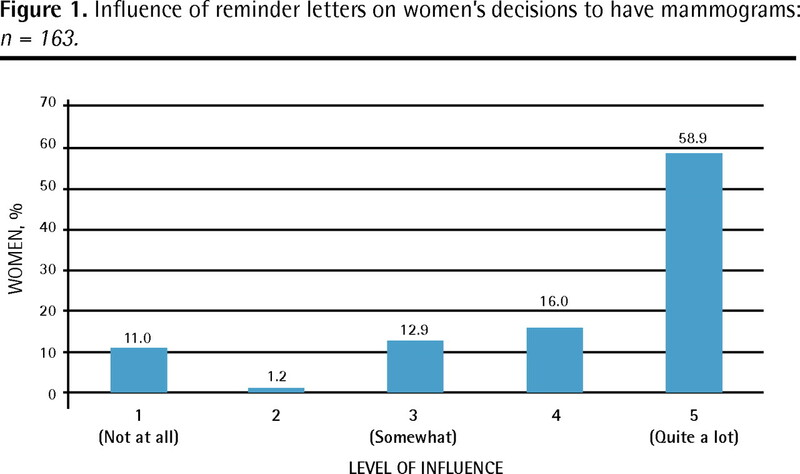 Influence of reminder letters on women’s decisions to have mammograms: n = 163. Most women (77.1%, 296 of 384) wanted to receive or continue to receive reminder letters for mammography. Almost a third of the women (28.9%, 111 of 384) wished to receive more information about mammography and breast cancer. Of these, 73.0% (81 of 111) preferred information in the form of a pamphlet and 21.6% (24 of 111) preferred a dedicated website. Participants in the 2 focus groups (n = 3 and n = 5) indicated that they were receptive to reminder letters from their family physicians for screening mammography. Inclusion of the physician’s name on the letter was thought to be important, as was personalization of the letter with the patient’s name. Women felt that the use of a reminder letter reflected their doctors’ support of the screening test and concern for them. Most felt that the letters had clear messages and instructions. Participants indicated that women who had not been screened before might have different information needs. There was also interest in practical information, such as how to obtain transportation assistance. Not surprisingly, the personalized reminder letters from family physicians influenced women’s decisions to have mammograms and were seen as reflecting the physicians’ support for preventive screening. Previous studies found similar results but these were based on face-to-face counseling rather than mailed letters.10,11 Respondents who did not find the reminder letters helpful might have already scheduled appointments or decided to do so before receiving the letters. Alternatively, women who did not find the letters helpful might have been the same ones who did not get mammograms. While there is substantial evidence supporting different reminder modalities to increase the use of preventive services, there are very few studies that have examined how such proactive interventions are viewed by the patients themselves.12,15–17 Some evidence suggests that attention to the format and content of patient reminder letters will likely further enhance their effectiveness.3,12 Ornstein et al conducted focus groups in which patients were asked to evaluate the reminder letter and other preventive services reminder materials used in an earlier study. The findings from these focus groups resulted in the development of a warmer, more personal letter, sent to patients at the time of their birthdays, that included a leaflet describing the rationale for preventive services and answering common questions about prevention.15 There is also some evidence suggesting that older patients are more likely to find reminders helpful18 and that stronger patient-provider relationships, with high levels of trust, are associated with improved adherence to recommended preventive services.19 It is also important to point out that the larger demonstration project of a reminder and recall system for preventive care services, on which our study was based, sent a second reminder that included patient education leaflets to eligible women who remained unscreened after the first letter. In our survey, however, only a random sample of women who received the first reminder letter was included. The reminder letters included a brief explanation of the rationale for screening mammography, and relatively few women were interested in additional information about mammograms. The focus group discussions revealed that women who had been screened, and therefore would have viewed videos or had the procedure explained to them before the test, felt they were adequately informed, but that women who had not yet been screened might benefit from additional information. Consequently, reminder letters should be tailored to women’s needs, and letters sent to women who are newly eligible for screening mammography should include additional educational resources. The cumulative evidence around the use of reminder letters to increase the use of preventive services clearly establishes their effectiveness, and there is growing evidence that the patients welcome such letters. Furthermore, these reminders appear to be particularly effective when they originate from one’s own family physician, are personalized, and are coupled with relevant educational content. Eliciting patient feedback on reminder systems for preventive services can help ensure that features important to patients are included, thus further improving their acceptability and effectiveness. This work was supported by the Ontario Ministry of Health and Long-Term Care Primary Health Care Transition Fund. There is very good evidence that reminder letters increase the use of preventive services by patients, including the uptake of breast cancer screening. Reminder letters are especially effective when they are personalized, come from the person’s family physician, and are linked to educational content. Plusieurs données indiquent que les lettres de rappel augmentent l’utilisation par les patients des services préventifs, incluant le dépistage du cancer du sein. Les lettres de rappel sont particulièrement efficaces quand elles sont personnalisées, proviennent du médecin de famille de la patiente et s’accompagnent d’un contenu informatif. Drs Kaczorowski, Karwalajtys, Lohfeld, Roder, and Sebaldt and Ms Laryea and Ms Anderson contributed to concept and design of the study; data gathering, analysis, and interpretation; and preparation of the manuscript for submission. Canadian Task Force on Preventive Health CareScreening for breast cancerLondon, ONCanadian Task Force on Preventive Health Care1994. Available from: www.ctfphc.org. Accessed 2009 Apr 12. WaddenNDoyleGPBreast cancer screening in Canada: a reviewCan Assoc Radiol J20055652715Erratum in: Can Assoc Radiol J 2006;57(2):67. Cancer Care OntarioBreast screeningToronto, ONCancer Care Ontario2006Available from: www.cancercare.on.ca/pcs/screening/breastscreening/. Accessed 2008 Apr 12.